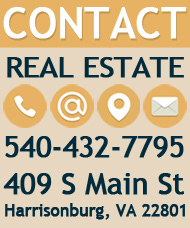 Harrisonburg levies a tax of $2.12 per $100 of assessed value on tangible personal property employed in a trade or business (furniture, fixtures, equipment, machinery, tools, etc.) Every taxpayer operating a business in the City of Harrisonburg on January 1 is required to file a business personal property return on or before March 31 (except if the date falls on a weekend or holiday, then it is the next business day) of the tax year. Under provision of law, the taxpayer is required to list all furniture, fixtures, equipment, and all other tangible property, including personally owned items, used to conduct business. This listing must be attached to the business personal property return. A separate return must be filed for each business location. The taxpayer shall submit a schedule of fixed assets, grouped according to the year acquired and the total original cost. The total original cost includes all costs incidental to acquiring and placing an asset in use, i.e. freight, installation, sales tax, etc. All furniture and equipment must be reported, even if fully depreciated (on federal income tax schedule). Do not list application software, real estate, or vehicles. Manufacturers are required to report only the machinery and tools used directly in the manufacturing process. Do not include in your listing any leased equipment for which you are not responsible for the taxes. These items must be reported separately on Section 3 on the front side of the form. Please do not write "See Attached" or "Same as last year" on the return. The return will not be accepted as complete or on time and will be returned. Failure to file the business personal property return will result in a statutory assessment and a 10% penalty. Likewise, any return filed after March 31 of the tax year will be assessed a 10% penalty. Please make sure that the United State Postal Service has postmarked the return by March 31st (except if the date falls on a weekend or holiday, then it is the next business day). A filing extension of 90 days may be requested prior to March 31. The payment due date is December 5. A bill will be mailed prior to the due date. Please contact our office 540-432-7704 with any questions. Every business owning a motor vehicle (automobile, truck, bus, motorcycle, trailer, semitrailer, van, recreational vehicle, moped, etc.) is required to file a personal property tax return. Vehicles are assessed at clean trade in value as of January 1 as determined by National Automobile Dealers Association (N.A.D.A.). In the event that you move or change your address, you should notify the office of the Commissioner of the Revenue as soon as possible so that we can properly update your records. We do not receive automatic updates from the Post Office or Department of Motor Vehicles (DMV). All bills and personal property forms will be sent to the last address given to us by the taxpayer. So, to ensure you receive all mail from us in a timely manner, please inform us of any address change by calling our office at 540-432-7704, or fax us the information to 540-432-7781, or email Deanna.Lam@harrisonburgva.gov. If the business would like to designate an individual(s) to act on behalf of the business, please complete the form: [157KB] Declaration of Representation form. This form will allow the Commissioner of the Revenue to share confidential information with this individual(s). Note: Fillable forms may not show up properly in all browsers. If you experience problems viewing a PDF with form fields, simply save the PDF file to your computer (right click the link then select "Save target as"/"Save link as") and open it using Adobe Reader. Please contact the office for a blank form if you cannot get the form to load for you. Food and Beverage Tax - 7.0% on all prepared food and beverage sales. [3.6 MB] Food and Beverage report. Admissions Tax - 5% on fees for admission or entrance into events or for amusement activities, such as movies, theater, concerts, lectures, etc. [1MB] Admissions Tax report. Transient Occupancy Tax (also known as Hotel/Motel Tax) - 7.0% on fees charged for short-term lodging, including, but not limited to, hotels, motels, bed & breakfast establishments, and short term rentals (i.e. Airbnb, VRBO etc.) [864KB] Transient Occupancy Tax report. Short Term Rental (nonlodging)-1% on rentals 92 consecutive days or less, 1.5% on heavy equipment rentals 270 consecutive days or less. 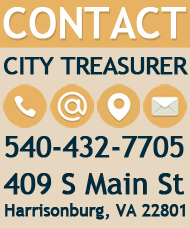 The preceding four taxes are called trust taxes, meaning they are collected and held in trust by the business establishment, and reported to the City of Harrisonburg each month and or quarter. Please make sure that you have the United States Postal Service postmark your return by the due date or deliver the return to the Commissioner's office to avoid late filing penalties and interest. *NOTE: The City Council has adopted a change in the Arts and Cultural District ordinance that exempts all businesses situated within the district and with current business licenses issued by the City of Harrisonburg from the fees for admission taxes imposed by Chapter 2 of title 4 of the Harrisonburg City Code. 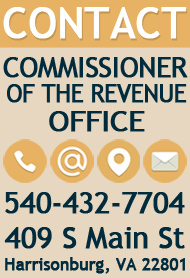 Please contact the Commissioner of the Revenue office with any questions regarding this exemption. Utility Service Tax - $15.00 each month on the consumption of electricity and natural gas. Cigarette Tax - $.30 per pack of cigarettes. For more information on these taxes, please reference the Harrisonburg City Code, Title 4, Chapter 2.